I have finally read and review a novel where reality television would be covered as a theme. Running Man by Richard Bachman AKA Stephen King is probably the precursor to The Last One by Alexandra Oliva. It is a debut novel due to be published in July 2016. The novel covers contestants in a Survivor-inspired scenario where the last one remaining would win a million dollars. The cast of characters have politically incorrect names like Waitress, The Exorcist, Air Force, Black Doctor and Banker. Each of those names expresses that character’s main personality trait or background. Also, there is another storyline that focuses on a woman named Zoo and her solo journey through the same type of scenario. Oliva does an effective of alternating from the first person viewpoint of Sam to the third person narrative of her with the other characters throughout the entire novel. The juxtaposition of the two storylines reveals how reality television can really alter our perception of what is real. 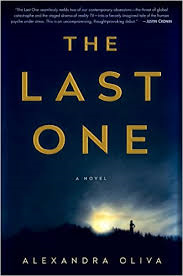 The Last One is a competent debut novel that kept me engaged throughout the reading experience and I believe has the potential to become a major hit for 2016. Oliva has penned the first beach read for the summer of 2016 that will keep readers flipping pages or scrolling on their Kindles while on vacation.